Writing an introduction, coming up with effective headings and titles, presenting a conclusion, and the important steps of editing and revising are covered with class-tested advice and know-how in this book. In addition to using updated examples of student topics that pull from both American government and international relations, Baglione also includes examples of actual student writing to show readers how someone "just like them" accomplished tasks while writing their papers. 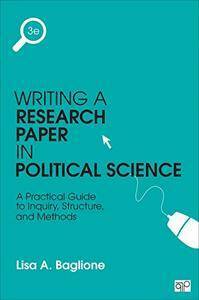 Practical summaries, calendars, exercises, and a series of handy checklists make this a must-have supplement for any writing-intensive political science course.